In meetings with retail customers about transportation management the various deployment options of SAP’s transportation management are always an interesting point of discussion. As solution manager for Digital Logistics in SAP’s retail organization I am happy to share some thoughts about the on-premise deployment options of SAP’s transportation management. SAP’s transportation management consolidates orders and maximizes the return on a retailer’s transportation spend. It forecasts freight demand and shipment volumes accurately to fine-tune transportation planning. It enhances freight, fleet, and logistics management to gain real-time visibility into global transportation and domestic shipping across all transportation modes (road, sea, rail and air) – inbound from the suppliers to the retail distribution centers, and outbound for store replenishment and fulfillment of e-commerce orders. Finally, SAP’s transportation management prepares freight settlement based on the agreed tariffs and conditions and hands over for carrier payment to SAP Finance. 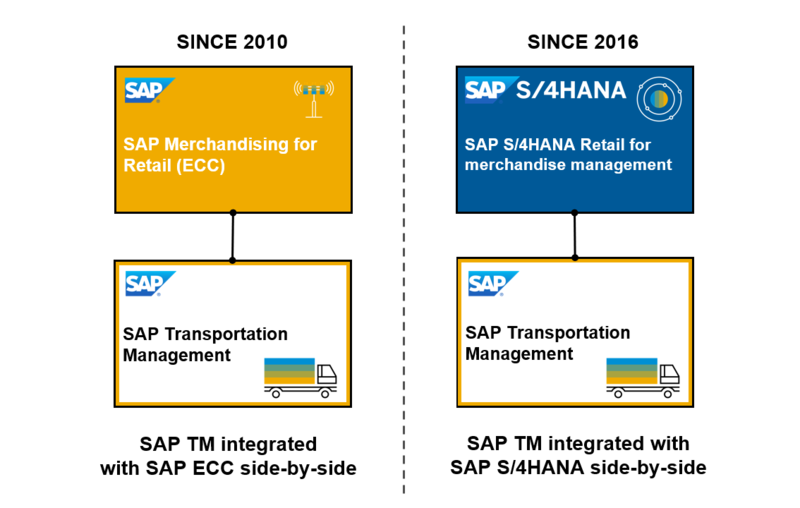 SAP’s transportation management can receive and process transportation requirements from SAP Merchandising for Retail and also from SAP S/4HANA Retail for merchandise management (on-premise edition). SAP Merchandising for Retail is the industry specific version of SAP’s classical ERP solution (some still know it as IS-Retail). It is a real-time integrated solution for merchandise management that enables head office, stores as well as trading partners access to information and transactions that support best practice business processes across the entire retail merchandise lifecycle. SAP Merchandising for Retail is available since 1996 and has been constantly evolved in over 20 years. The latest release is SAP ERP 6.0 Enhancement Package 8. In October 2016, SAP launched the industry specific version of the SAP S/4HANA product line for retail companies: SAP S/4HANA Retail for merchandise management (on-premise edition). This solution is the digital core of a retailer’s future value network. It enables retail companies to connect their workforce, suppliers, consumers, and the Internet of Things (IoT) in real-time to capture every opportunity and leverage digital transformation for increased business value. The current release is SAP S/4HANA Retail for merchandise management (on-premise edition 1809). SAP’s transportation management is offered in various deployment options. Let’s discuss the on-premise deployment options in the following one by one. Since 2010 SAP Transportation Management (SAP TM) is offered as part of SAP’s Business Suite in a classical decentralized approach with SAP Merchandising for Retail as backend, the latest release is SAP TM 9.6 (released in December 2018). This decentralized or side-by-side approach means that SAP TM receives its transportation demands from the ERP system (SAP Merchandising for Retail), processes the transportation specific steps and sends the needed information (e.g. for carrier freight settlement or freight cost distribution) back to SAP Merchandising for Retail. Consequently, SAP TM can guarantee performance and availability as it receives a chunk of ERP orders or ERP deliveries from SAP Merchandising for Retail and can afterwards process this particular workload independent from the ERP system. SAP TM works independently of the core ERP system (SAP Merchandising for Retail) regarding ERP performance and planned or unplanned ERP downtimes. Furthermore, the retail company can run different release strategies between SAP Merchandising for Retail and SAP TM, e.g. upgrading bi-yearly on ERP side while upgrading yearly on TM side. SAP TM can be integrated out-of-the-box with SAP Merchandising for Retail. In October 2016, SAP launched the industry specific version of SAP S/4HANA for the retail industry: SAP S/4HANA Retail for merchandise management (on-premise edition 1610). 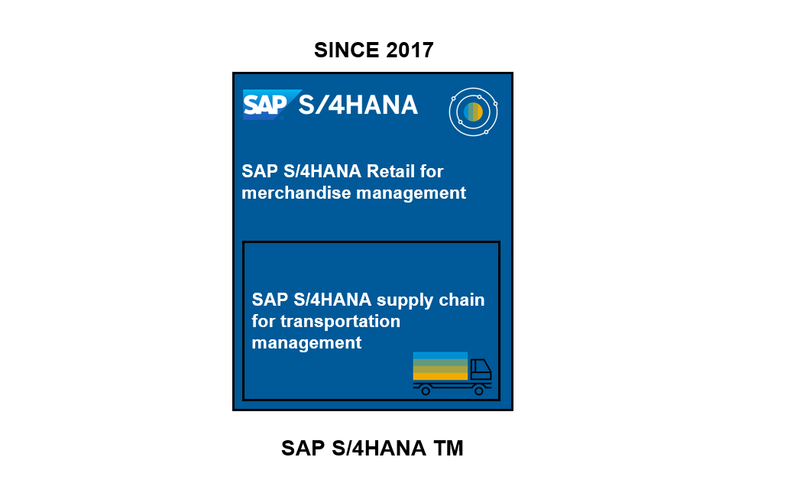 SAP Transportation Management (Business Suite) can be integrated out-of-the-box with SAP S/4HANA Retail for merchandise management (on-premise edition) as side-by-side deployment. SAP S/4HANA Supply Chain for transportation management embeds SAP TM’s best-of-breed functionality in the S/4HANA solution. It enables retail customers to optimize their transportation process end-to-end and harmonize their transportation master data, such as business partners, locations and product masters – allowing to build and maintain one set of data used by all business units. SAP S/4HANA TM provides FIORI harmonized user interfaces and real-time embedded analytics within SAP S/4HANA. Lean and simplified processes with less business documents: Transportation objects can be created directly, no replication of logistics business documents in inbound/outbound processes (transactional data). Transportation requirements (freight units) are created directly from e.g. SAP S/4HANA orders without needing the business object “transportation request” for replicated order data. Aligned user experience: Harmonized entry point with Fiori Launchpad and a FIORI harmonized user interface. Best practice processes for a fast set-up of transportation scenarios in the SAP S/4HANA system, please see SAP Note 2535942 SAP Best Practices for SAP S/4HANA Supply Chain for transportation Management. 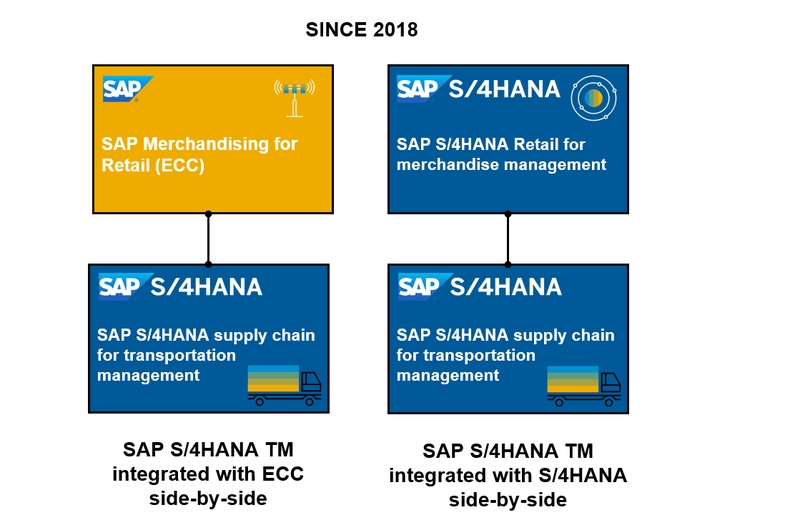 Since 2018 SAP S/4HANA TM can be integrated with either SAP Merchandising for Retail (ECC) or SAP S/4HANA Retail for merchandise management as side by side deployment (SAP S/4HANA 1709 FPS02 and SAP S/4HANA 1809). It is a complete SAP S/4HANA installation – in which only the SAP S/4HANA TM part is used – integrated with either SAP Merchandising for Retail or SAP S/4HANA Retail for merchandise management. Of course, in this side-by-side approach the advantages of the embedded approach (system-internal processing) mentioned above under b) do not apply. But SAP S/4HANA TM integrated side-by-side with SAP S/4HANA comes with FIORI harmonized user interfaces and real-time embedded analytics using Core Data Services of SAP S/4HANA. It allows for a different release strategy for SAP S/4HANA TM and the ERP system and it also offers independency regarding planned and unplanned ERP downtimes. Please check SAP Note 2714892 Transportation Management – Deployment Options for further details. Now, we have discussed the various deployment options of Transportation Management for the retail industry, but which option to choose? If you would like to have some guidance regarding this question, please read on in part II.